Krishan Kalra June 23, 2018 No comments. There are so many problems with our ‘Health Care’ system that I am at a total loss, where to begin this article. From crowds and filth at the iconic AIIMS, mortally sick patients being turned away from hospitals either for want of money or due to shortage of beds or a ‘police report’, babies being delivered outside the hospital doors, a nurse’s baby dying in Betul, fake medicines to unnecessary diagnostic tests and even surgeries, rampant kickbacks, insane “incentives” to doctors; there are all kinds of stories and ‘cocktail circuit gossip’ floating around. Meantime, of course, people continue to suffer, many have to mortgage their houses to pay for the treatment of their family members, others just die as they are unable to afford. Enormity and complexity of a ‘Health Care System’ can be judged from a recent statement, made by the legendary investor Warren Buffett – whose company has joined hands with Amazon & JPMorgan Chase to “disrupt” Health Care in USA – when he likened it with a “Hungry Tape Worm on the American economy”. We, in India, can get some sadistic pleasure from the fact that we are not alone in this mess. We do, however, need to seriously look atour own problem. Putting in place a ‘universal health care’ system for all is perhaps not even feasible for the government – resources required are humungous – and the private sector can barely take care of their own senior people. Even the reach of their CSR funds is limited to a few ‘memorial hospitals and institutes’ which manage to corner cheap prime land from the government, on the express condition of providing certain number of ‘free beds’ to the poor, but more often these are appropriated for extending favours to those in power. In his budget 2018 speech, finance minister has made a beginning – with what he has termed as the National Health Protection Scheme (NHPS) – by significantly increasing the limit of ‘universal medical insurance cover for the poor’ and promised to extend its reach to a 100 million most vulnerable families. He has described it “as a first step to universal health coverage”, a promise made by the BJP in their 2014 general election manifesto. Intent is indeed laudable as, according to IRDA, two-thirds of all medical expenses in India are paid for directly by the patients and their families! Those covered will be able to get treatment in any hospital – government or private. Let’s hope and pray that it works and government has the requisite funds to make it succeed. This proposed model of ‘public costs underwriting private provision’ is a new experiment and would need an overarching regulatory structure to protect the system from dangers of over-treatment and over-charging by private hospitals. Actually we have an ironical situation. India has the best of doctors – our physicians and surgeons in almost all specialties and super specialties are as good as, if not better than, those in advanced economies – we have an ‘old culture’ of empathy and caring for the needy, our new age private sector hospitals are equipped with the latest machines and robots, even our hygiene and ‘infection control systems’ are of international level. And yet, we see so much suffering and misery all around! Even the so called ‘upper middle class’ is unable to cope with medical costs when someone in the family needs to be hospitalized. Perhaps the only explanation is that the number of hospital beds and doctors per 1000 population is woefully inadequate. What can we do to mitigate the situation? Of all the ‘villains’ in this complex situation, I think the menace of printing artificially high MRP on medicines and consumables is perhaps the worst and, also interestingly, a ‘low hanging fruit’ which can possibly be tackled in a relatively easier manner. All other measures – like setting up of 150,000 Health Centers in the country, at a cost of Rs.1,200 crores, under the National Health Policy 2017, which looks like a non-starter on paper itself! I can’t imagine a ‘Health Centre in Rs.80,000 – are too ambitious and even impractical. Investigating the criminal malpractice of big kickbacks on diagnostic tests could be another ‘not unsurmountable’ exercise. In any case we have to move in small steps. Tackling the MRP scam could be the first one. Let me explain the issue with some simple examples. A box of disposable gloves – one of the most common consumables – of a fairly popular brand, containing 450 grams of the product, has an MRP of Rs.600 printed on it. Any neighborhood chemist – as I personally found out in the Delhi suburb of Ghaziabad – would charge Rs.150 for it from a regular individual user, say someone having a ‘home care patient’ in the family and needing perhaps 3 or 4 boxes in a month. We can safely assume that a small hospital, using may be 200 boxes per month would be getting the same for Rs.100 or less. A bigger hospital’s cost should be still lower, say, Rs.60 or just 10% of the MRP. Now, what do the hospitals charge from the patients? To the best of my knowledge, almost all hospitals bill the patients at MRP! Typically, in a hospital bill, medicines and consumables account for around 60% of the total; so this is where they make their profits. In case of some other commonly used consumables, margins are a little lower. Feeding Bags box, MRP RS.500, comes to this individual customer for Rs.150; Suction catheter, MRP 42, for 11; Urine catheter, MRP 380, for 130 and so on. Situation is only a little better in case of medicines. Average discount on the MRP, extended to a hospital,for branded drugs still under patents, varies between 30 -50% and, once again, these are billed to the patients at MRP. Shockingly, chemist outlets in the hospitals won’t even give you the usual 10% discount offered by them to senior citizens or other regular buyers at their outlets outside.However, in case of ‘off patent trade generic’ drugs, the discounts could be enormous like for consumables. Barring some drugs on the ‘National List of Essential Medicines’ (NLEM) where the prices are fixed by the government, there is literally free for all! Government did indeed make a beginning by capping prices of stents last year, but the results are mixed. In fact the NPPA (National Pharmaceutical Pricing Authority) had even forced device makers, perhaps for the first time ever, to put the correct MRP tags on the devices, to prevent overcharging by the hospitals. It appears that most private hospitals have jacked up the ‘angioplasty package cost excluding the price of stents’ to make up for the loss of margin on the stents. CEO of one of the largest players in the field has gone on record to say that “earlier procedures were underpriced and implants were overpriced and that this is being corrected now”; so much for the government order capping the stent prices. An encouraging response has however recently come from the All India Syringes and Needles Manufacturers Association to voluntarily cap trade margins at 75% over their discounted net ex-factory prices including GST. This would effectively mean a maximum trade margin of about 43% on the MRP – a far cry from the 80-90% earlier. We need many more initiatives like this. Admittedly, the MRP scandal is not exclusive to medicines and consumables in Health Care. It seems to be a generic! As an example, my research shows that, a common FMCG item like liquid Hand Wash – of a very popular brand – carries an MRP of Rs.300 on the 750 ml pack but you can easily buy it on Amazon for about Rs.90 net including GST of Rs.15 after availing the myriad “cash back” schemes. Even, from the stores, the price including all taxes doesn’t exceed Rs.169 before availing one of the many discounting schemes. However, in case of the Health Care industry, this practice becomes a really nefarious one. What can be done about this problem? How can the government stop hospitals from earning such obscene profits on drugs and consumables? NPPA, along with eminent doctors and the watchdog community of senior chartered accountants and consultancy firms, could surely come up with a practical solution. A simplistic – though admittedly retrograde – approach could be to impose GST on the printed MRP or a price after reducing a margin that is considered fair by the practitioners. Such a move would certainly open up the mystery of astronomically high MRPs that lead to all kinds of malpractices in this all importantlifesaving industry. 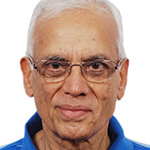 Mr. Krishan Kalra is a former President of All India Management Association (AIMA) and now does voluntary work in several sectors including Health Care. Views expressed are personal.